St Aloysius College was built in 1882. The southern wing of the building formed the Chapel as a place of prayer for students. The Chapel built in 1885 by Rev Father Joseph Willy, is a replica of world renowned Sistine Chapel at Rome. The main part of this chapel is a large hall, which is called the nave. On either side of the nave are the two aisles. The raised platform is called sanctuary. Touching the wall of the sanctuary is the main alter. The paintings on the ceiling are canvases, and on the walls, are frescoes. While every painting has its own special appeal, some have a special significance. The Chapel is primarily a place of prayer where people can commune with God. The paintings which adorn it are primarily meant to help us to pray. Their artistic value can be best appreciated in an atmosphere of prayerful silence. The central row of paintings on the ceiling depicts the life of Aloysius Gonzaga to whom this College and Chapel is dedicated. Aloysius was the eldest son and heir of the Marquis of Castiglione in Italy. He wanted to lead a religious life in order to serve his fellow men. Therefore, he gave his right to the marquisate to his younger brother. This event is depicted in the fourth (from the rear) painting on the ceiling. Aloysius, dressed in black, hands over his sword to his younger brother. His mother presides over the ceremony. The lawyer and his clerk write down the deed and curious servants witness the event. His earlier life is shown in the first three panels from the rear and the rest of his life is depicted on the wall behind the altar. The central picture behind alter depicts him serving the plague stricken in Rome. Aloysius was doing his religious studies in Rome, when a plague broke out. Victims of the plague were abandoned on the streets. Aloysius joined a group of volunteers to help the victims and became very week and died. The painting on the right shows him reconciling his brother with his uncle. The painting to the left shows his death at the young age of 23 years. On the panels of either side of the sloping portion of the ceiling are portrayed the Apostles. The upper arches depict the great saints of the church. The lower arches depict Jesuit saints. The largest painting in the church is on the rear wall opposite the main altar. It shows Jesus as the friend of children. It is considered to be the masterpiece of Moscheni. This Altar and the place around is dedicated to the BLESSED VIRGIN MARY, with her child Jesus Christ. On the right is seen, ADAM and EVE, the first man and woman created by God. The rest of the Aisle is taken up with the Scriptural history of the life of Our Lord. Bro. Antonio took only two and a half years to complete the work in Mangalore. Paints were not available locally and Europe was too far to import them. But Bro. Antonio prepared the paints himself using vegetable dyes. One can only wonder how he managed to put up the high scaffoldings to go up to the ceiling. Even with the help of steel structures it was a formidable task to erect scaffolding when the paintings were restored by the INTACH ICI of Lucknow. It took 7 specialists four years to renovate the paintings. 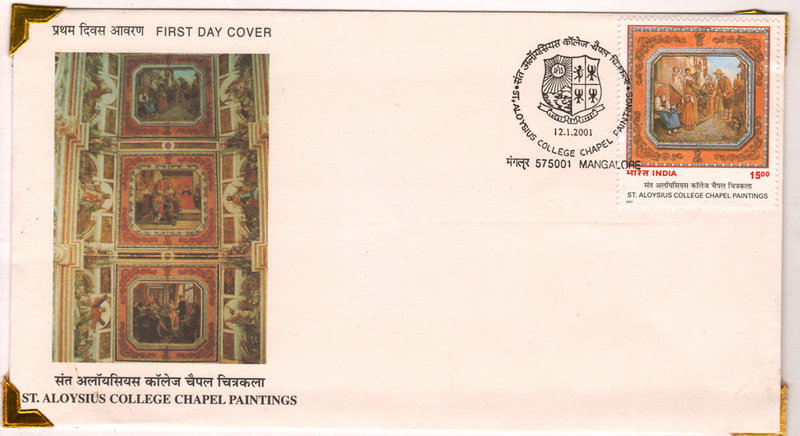 The Department of Posts, Govt of India brought out a Commemorative Stamp on St Aloysius College Chapel Paintings on 12 January 2001. Antonio Moscheni was born in a village called Stezzano near Bergamo in Italy on January 17, 1854. Fortunately for him, his artistic talents were discovered early and he was sent to the famed Academia Carraa in Beganeo. He studied under able masters and soon acquired considerable proficiency in the art of painting. He then went to Rome to study the masterpieces of the Vatican. Fresco painting now became his passion. His recognition as a world class painter came at the official exhibitions of his paintings held in Milan, in 1883 and Turin, in 1884. In 1889 Antonio renounced the prospects of a brilliant career and became a religious in the Society of Jesus. But his religious superiors did not wish his talents to be buried. They ordered him to paint several churches in his native place as also the Chapel of St Aloysius College. Moscheni, single handed had covered every inch of the Chapel, a total of 829 sq. meters. It took him over two years to cover the walls and ceilings of the Chapel with frescos and oil paintings. Later he painted the Holy Name Cathedral in Bombay. Bro. Antonio was primarily a man of God. His paintings not only draw the admiration of all who see them for their harmony of colours and figures but also raise their hearts and minds of God. This is the experience of people of all religions who visit the chapel. The power of his paintings comes from the deep union of the brother with God. Bro. Antonio had to use his powerful imagination honed by meditation and contemplation to conjure up the pictures which he translated into paintings. “What an inspiring place this must be” cried the Governor of Madras Lord Willingdon when he first visited the Chapel. Antonio was a man in union with nature. People who are close to God are also close to nature as is seen in the lives of many saints like Francis of Assisi and Ignatius. Bro. Antonio’s paintings abound with flowers and fruits. His paintings indeed reflect the contemplation to obtain love prescribed by Ignatius as a culmination of the spiritual exercises to find God in the whole of creation in its beauty and marvels. 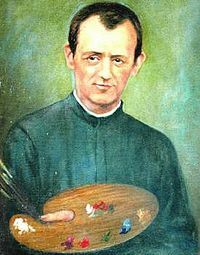 On 15 November 1905, as he was painting a Church in Cochin he went to see the face of the Divine Master which he had, in various ways, fixed on canvas. Visitors are requested to REMOVE their FOOTWEARS, SWITCH OFF your CAMERA & MOBILE PHONES before you enter the Chapel. Maintain the Silence & Discipline inside the Chapel. NO PHOTOGRAPHY & VIDEOGRAPHY permitted inside the Chapel. Post cards & Booklets of the Chapel paintings are available with the chapel guide. Visitors are requested to write their names and impressions in the Visitors’ Book. Under any circumstances, the chapel will not be opened after 6:00 p.m. The Chapel is open to the tourists/visitors every day. Timings: Tuesday to Sunday: 9.30 a.m. to 1.30 pm & 3.00 p.m. to 5.30 p.m.
Mondays: 9.00 a.m. to 12.30 pm & 2.00 p.m. to 4.00 p.m.
During the Religious Worship & Services and cleaning times, tourists/visitors are not permitted to see the Chapel. A Guide is available on the above mentioned timings. The service of the Guide is free of cost. A Contribution towards the maintenance of the Chapel and the paintings is appreciated. Guided tours are conducted every 30 minutes. Visitors are requested to contact the Chapel Guide in advance and inform him about the time of their arrival to confirm the availability of the Guided Tour facility. Daily Mass : 6.45 a.m & 8.15 a.m.
Sunday Mass: 6.30 a.m. & 8.00 a.m. If the Chapel is closed during timings given above, you can contact below given numbers. Mass at 6.45 am, 8.15 pm & 11.45 am. PLEASE NOTE: ALL THE CEREMONIES WILL BE HELD AT SAC HIGH SCHOOL HALL.